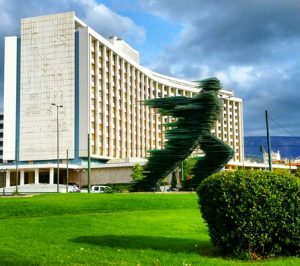 Hilton Athens has been recognised as Greece’s Leading Business hotel for a second consecutive year at the 23rdedition of the prestigious World Travel Awards, recognised across the globe as the most prominent and comprehensive benchmark for excellence in the industry. At the 2016 Europe Gala Ceremony, held in Sardinia, Italy on 4 September, Hilton Athens scooped one of 29 awards won by Hilton Worldwide properties and brands, as voted for by travel and tourism professionals globally. For the third year in a row, Hilton Hotels & Resorts has been named Europe’s Leading Hotel Brand in 2016, further reinforcing its position as the stylish, forward-thinking leader in hospitality and reflecting its presence in 31 countries and territories across Europe. More information on the categories and winners of the World Travel Awards 2016 can be found at www.worldtravelawards.com/winners/2016.